Calcium looping is a promising concept to reduce anthropogenic carbon dioxide emissions. Climate change, arguably one of the most important challenges of our century, is triggered primarily by anthropogenic emissions of greenhouse gases, in particular CO2. Despite an increasing public, industrial, and political awareness, CO2 emissions are projected to increase further in the following decades. In this context, carbon capture and storage (CCS) has been proposed as an effective near- to mid-term solution to reduce anthropogenic CO2 emissions. A viable CO2 capture technology relies on CaO as the CO2 sorbent forming CaCO3 in the capture step. Advantages of such CaO-based CO2 sorbents are their low price due to the large abundance of natural precursors (e.g., limestone, dolomite), a high CO2 uptake capacity (0.78 gCO2/gCaO), and the fast kinetics of the underlying CO2 capture and regeneration reactions. However, the main obstacle to the widespread use of CaO-based CO2 sorbents is the short life span of such sorbents due to the deterioration of their microstructure under the harsh operating conditions (i.e., 650-900 °C), leading to a rapid decay of their initially high CO2 capture capacity. Therefore, mitigation of the sintering-induced capacity decay of CaO-based materials is a key challenge and requires the manufacture of sorbents with a thermally stable micro- and macro-structure. In the work reported here, we have developed CaO microspheres featuring structural characteristics which affect very favourably their CO2 uptake. 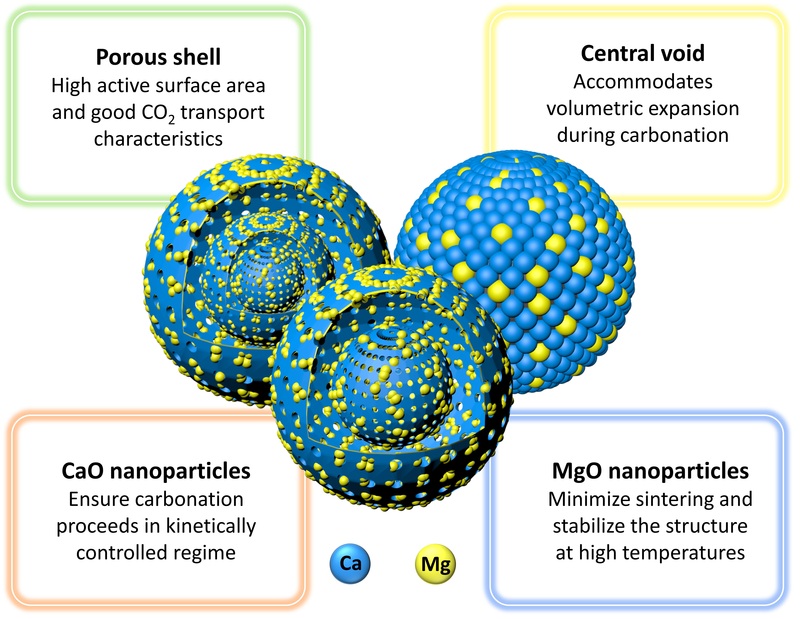 These CaO microspheres exhibit a hollow spherical morphology, whereby the central void is able to accompany the large volumetric expansion of the material (i.e., approximately by a factor of two) during CO2 capture. The central void is realized through the removal of a sacrificial carbonaceous template derived from in situ hydrothermal treatment of xylose. The shell of the hollow spheres is composed of an assembly of CaO nanoparticles (i.e., < 100 nm) which effectively minimize the diffusive transport limitations of CO2 through the growing product layer of CaCO3 during the carbonation process and thus, maintain the inherently fast carbonation kinetics. Realizing hollow microspheres is one challenge, maintaining their original architecture throughout the carbonation and regeneration cycles under harsh operating conditions is another. To extend the lifespan of these sorbents, their aforementioned favorable morphological characteristics have to be preserved by introducing sintering-resistant materials as structural stabilizers. We have selected MgO as a stabilizer owing to its high thermal stability and more importantly, due to the fact that it does not form a solid solution with CaO under operating conditions, as opposed to Al2O3, a commonly used stabilizer, which reacts with CaO during cyclic operations and forms a solid solution that is inactive for CO2 capture. The chemical interaction of the stabilizer with CaO is not desirable, since it reduces appreciably the quantity of CO2-active CaO and in turn, the overall CO2 uptake capacity of the sorbent (on a gram of sorbent basis). Incorporation of MgO into the structure was carried out in situ during hydrothermal synthesis, enabling a single-step synthesis protocol which opens up the opportunity to produce larger quantities of material at a substantially reduced cost. The synthesized sorbent with a MgO content as low as 11 wt. % demonstrated a CO2 uptake of 0.50 gCO2/gCaO after 30 carbonation and regeneration cycles, corresponding to a capacity retention of 83% and surpassing the CO2 uptake capacity of the limestone benchmark by more than 500%. (Authors: Andac Armutlulu and Muhammad Awais Naeem).